£999 for 5-hours (full day) for up to 15 people. Want to do a bigger event? Get in touch for price options. Fear is one of our most basic and primal human emotions and has been with us from the beginning. From our caveman days to our modern time stresses and challenges, fear is a driving factor that dictates many aspects of our lives. Unfortunately, fear can be very limiting and block us from achieving our highest goals and productivity in life. If you would like a totally unique and fascinating team building event that will help people break through their own self limiting fears in a fun way, consider Creature Courage’s team building package! We will lead a fascinating workshop using the wonder of animals and the fascinating science of the psychology of fear to help people beat anxiety and find new control over their emotions. 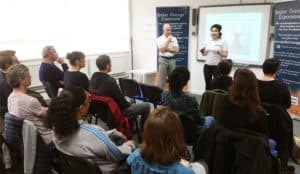 Using many of the proven therapy techniques we use in our phobia workshops, we will help people learn in a fun way of how to break through limitations, build courage and be more confident in both their personal and work lives. Fantastic for businesses, charities, organizations and even personal events that want to offer something that is as fun and unique as it is educational and life changing!